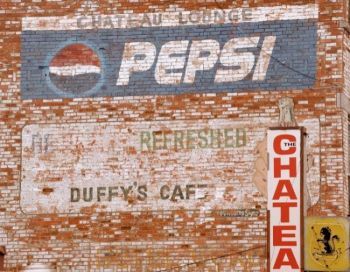 The brick signage has outlived the historic Chateau in Fort Pierre. Pierre and Fort Pierre are not lacking for institutions, but South Dakota's twin cities lost an important one this week when octogenarians Ed and Pat Duffy closed The Chateau Bar & Restaurant. Ed is ill and Pat is supervising a nutrition program at the Community Center that provides more than a hundred meals a day to seniors in Fort Pierre. They had to give up something. The cowboys and politicians and bureaucrats are the losers. Much state business and more than a few political compromises have been hashed out through the years at the Chateau and the nearby Silver Spur, a legendary watering hole started by Irish O'Leary in 1949. "Every great project, public or private, in central South Dakota had roots in that restaurant and a better man I've not seen in my lifetime," said John Duffy, a local attorney and Ed's nephew. "The Chateau was the home of South Dakota's rodeo, horse racing and ranch cultures as well the blue-collar workforce." The O'Learys and Duffys gave the cow town an authentic Irish flavor. Pat Duffy worked for O'Leary before she married and partnered with Ed at the Chateau. "He taught me that if you have a problem, you make the problem leave," she said. A "problem" is her politically-correct language for a problem customer. She believes the Chateau prospered because Ed knows beef. "He did his own meat," she said. "People would keep coming back for the the filet and the chicken fried steak, and the onion rings. They were always good and they were always the same." Before it was the Chateau, Ed ran Duffy's Cafe from the 107-year-old brick building. That was during the Truman administration. He added an addition when he started the Chateau. The big Duffy family gathered at the restaurant for a farewell dinner before they locked the front door. But traditions die hard in Fort Pierre. A half-block away, carpenters are working on renovating the Silver Spur, which as been shuttered for several years. A local entrepreneur, Buell Mayberry, intends to reopen it soon. And Pat says someone else is interested in possibly reopening the Chateau as a bar or restaurant. That's good news for local politicians and bureaucrats. There are never enough private nooks and crannies for deal-making in Fort Pierre or Pierre. The Chateau Ed & Pat Duffy will be missed by a lot of people. Will remember the Chateau for my life. My wife says that we ate there once. I don't remember it, but I do remember being at the Silver Spur a couple of times. That's been a long time ago! Any chance Pat and Ed would share that recipe for onion rings? None finer! Second home to the SD Retail Liquor Dealers for many years. Had many good meals and fun times at the chateau. What a treat it was to take traveling salespersons to the Chateau for dinner and a little business talk. They left town muttering to themselves.............great food, drink, and hospitality. Only in Central South Dakota could we have such a unique place. Thanks and best wishes to the Duffy's. I see Ed Duffy just passed away. Another end of an era. I ate at the Chateau in the early '80's every time I came through town on business. Best damn steak I ever had and always recommended them to whomever was headed that way since. Sad to see them go. I worked at the Chateau many years, kitchen, bartending and waitressing. Gretchen Lord Anderson I know that recipe for the onion rings made them many a time. It is all so missed by so many.